and neoclassical buildings lines the wide Neva River. The largest art museum in the world -- the Hermitage -- sits imposingly over the city, a palatial art powerhouse with over three million pieces in its collection. Chunks of titanic-sized ice float by in winter and riverboats in summer. June is high season for vacationers not only because the Russian sun peeks it head out for a respite from the bitter cold, but locals take to the streets for White Nights, a street festival atmosphere of twenty-two days and nights when the sun barely sets (book your hotel far in advance). Stop in a restaurant for Russian blini, delicate pancakes stuffed with jam, sour cream or savory fillings. warm summer in this part of the world. But (surprise!) 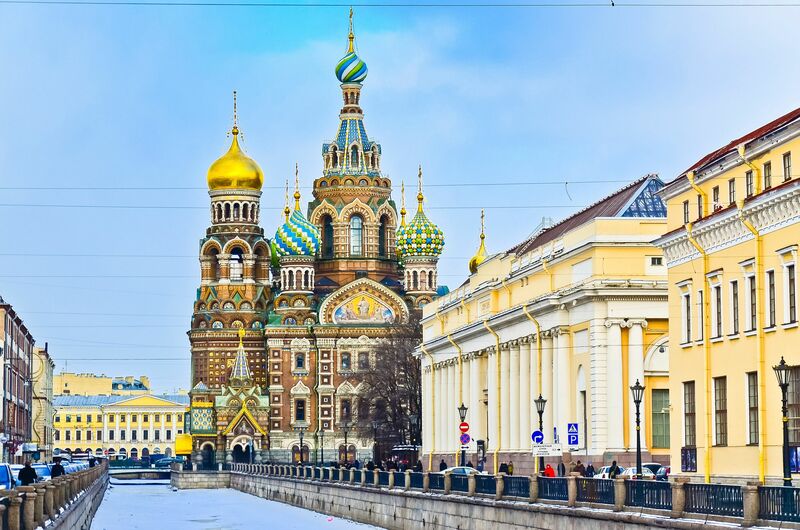 subarctic St. Petersburg makes up for its long, frigid winter by luring residents outdoors from mid-May through early September when temperatures break into the 60s (above 16C) and peak at about 75F (24C) in July. You’ll face bigger crowds and higher hotel prices during this time, but it’s worth booking ahead just to participate in the revelry of the White Nights (roughly mid-June through early July), when the sun stays out for almost 24 hours at a time and the concerts, festivals and parties go on all night. This is the most beautiful city on earth! Its architecture, history and people are amazing. Room temperature! It was like 50 deg. celsious. It was cold (it was winter and windows were leaky) and we only got thin blankets. Receptionist was unfriendly. A bit away from the city center. Noisy, very basic and no conveniences offered - but to be expected for the price you're paying. The bathroom sink seemed to always have hairs in it. We loved St. Petersburg and had perfect weather when we went in late May. If you're looking for good coffee, head to Smalldouble. We had an incredible dinner at Dom and don't miss the Faberge Museum. If you want to try a squid ink burger (all black burger including the bun and cheese) Wave is pretty fun and the owners are so incredibly nice. Loft Project is neat (it's little tiny shops in shipping containers and lots of cool local artists and designers). The central part of the city is gloriously beautiful. Try to go during the summer when you can experience the soft light up till midnight. It is a magical feeling to glide through the canals on a boat (see photo) off the Neva taking in the old ornate pastel colored buildings.For art lovers, it is a treasure trove of riches in the Hermitage, and you have always something in the performing arts; ballet, opera. Try to get out to Peter the Great's Imperial Estate of Petrodvorets about an hour ride by boat - like a Russian version of Versailles. Cosy cafe on Rubinsten street in St.Petersburt named "my zhe na ty" (мы же на ты) with wondeful atmospheer, full of books and good wine at evening. I've fallen in love with St. Petersburg, from the amazing churches and museums to the stunning canals. Perhaps it was the sunny weather when I visited, but I also found everyone very kind and warm. I can't wait to visit this magnificent city again. I also love how vodka comes with everything. St. Petersburg can be summed up succinctly as the House that Russian Tsar Peter the Great built. It was the creative imagination of Peter that lead him to leave the comforts of court life in Moscow and build a city from the "ground" up (St Pete was actually a swamp up in the tundra). St Petersburg is a feast for the eyes. The city seems to just scream for attention. Everywhere you look a work of art is discovered. The buildings are pompously massive and the palaces overwhelm the senses. A true gem and a must see destination. The roads are wide, the buildings are over-sized and one is in awe of the scale. However, for me the historical images conjured by the sites provides the most memorable experience. The 1905 revolution, the Russian Revolution and civil war and World War II all come to life while walking the streets of St. Petersburg. These are from the Leningrad Blockade Cemetary Memorial. Used as a mass grave during the seige of Leningrad in WWII, an estimated 500,000 victims of that seige were laid to rest here, many during the winter months when the ground was frozen. The statue of the woman holding oak sprigs signifies the countries matiarchal identity of the motherland with the carved sculptures, or "haut-reliefs" in the background. The wall of carvings depicts scenes from the siege in a familiar Soviet Era style the emphasized the communal effort to repel the Nazi invaders. Very moving........the music in the background adds to the surreal affect of the monument, a sprawling area that consists of a wide corridor leading to the statue of the woman several hundred meters long with smaller stone monuments on each side. Large symetrical stones and smaller walls on each side of the corridor are engraved with the names of army units and the different Russian ethnic groups that defended the city.